One log-in for forums and knowledge base management and preferably chat as well. Need way to collect metrics from the content management system. When accessing a locale that doesn't include the requested kb page, it should fall back to en-US (or the fallback language a logged in user has specified). However, the actual URL would still be the foreign locale, and there would be a message on the page saying e.g. "This page is not yet translated to [language]. Feel free to help us out." The Knowledge base is the back bone of the Firefox support platform. All known issues should be addressed, as best possible, in a user friendly knowledge base article that is easily and quickly accessible to an end-user. Help translates to "articles about things you can do with just Firefox", like adding a bookmark, using a keyboard shortcut, or similar. Articles under the Help category should be searchable from the Firefox built-in help window, as well as the SUMO web site. See Support below for what Help is not about. Reference charts: Reference charts are points of reference, that list all possible user-oriented options, like keyboard shortcuts, menu reference, command-line options, etc. Tutorials: Tutorials will take a feature of Firefox, and explain the very basics on how to get started using it. More advanced elements of a feature should not be included in a feature tutorial. How To's: How To's answer specific questions, regarding the use of Firefox, which could involve a part of a feature, or several features. Support translates to "articles about fixing problems in Firefox that require more than just Firefox, or highly technical stuff that should not be exposed to users of the built-in help". For example, how to move a profile folder, or how to configure Norton firewall to not block Firefox. Troubleshooting: This is the content that is more generally associated with “support” that helps users solve problems they have with Firefox. The troubleshooting section will initially be populated with MozillaZine Knowledge Base content that will be organized in a tagging structure that incorporated most frequently accessed questions data. KB style guides will allow for most user friendly help content and will evolve to include visuals. Knowledge base content will be community driven. Troubleshooting content will be driven in large part by user requests, while How To content will have some initial prioritization on what the most high-leverage areas for work. Only logged-in Mozilla volunteers will be able to suggest/make changes to documents, while users will be encouraged to comment on all content—although comments will be hidden from public view initially to eliminate spam problems. New articles will initially existing in a staging area, where it can be reviewed and edited, before being visible to people not logged in. Once approved for visibility to the general public, the reviewer will move the article from the staging area to the public knowledge base. All edits need to be made on a staging copy of the article. Once an edit is made, the edit is tagged for review. Contiguous edits by the same contributor will be treated as one edit. Anyone with given permission, can either approve or reject the edit. Once approved, the edit is applied to the KB version of the article. If the editor has reviewer permission, their own edit is automatically approved. Approvals and rejections are done on an edit-by-edit basis; so if there has been more than one edit to a staging copy, each edit has to be approved or rejected. All Firefox support documents should be written for an audience of a slightly below average internet user (doesn’t read blogs—or at least wouldn’t know one if he saw one) and take the tone of a friendly, helpful community volunteer. All articles will have a poll system to determine if the article is useful to users. Users are strongly encouraged to add comments on why something was not helpful, or what information would help them answer the question. If user writes highly-rated article, we want to recognize their success by giving them more power to edit articles without review, and automatically approve articles they have reviewed. Permission to make live edits to live articles should be restricted to those who have already earned our trust. There should never be incorrect information in Firefox Support KB articles. 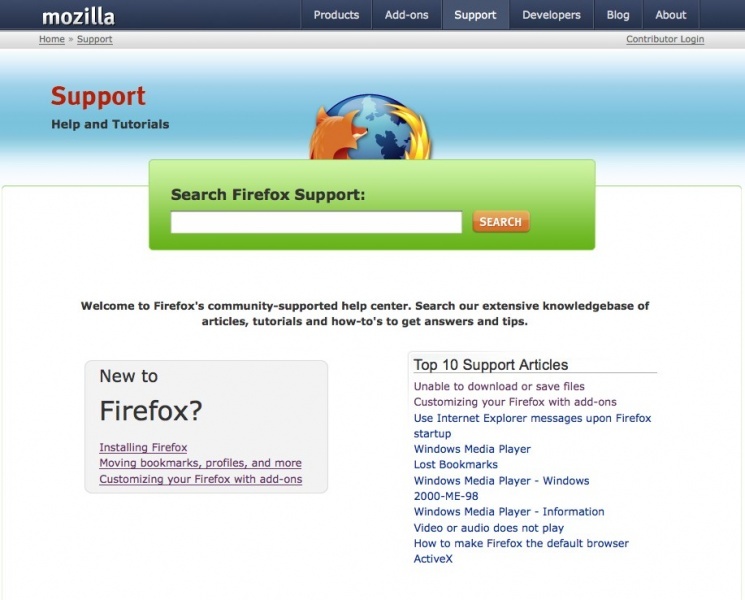 The Firefox support forums will provide users an opportunity to ask support questions that are not addressed in the KB. Users will be directed to search the KB before using the forum. The forums will also be used as a feedback mechanism for KB articles. End users may reach others' threads when looking for a solution. To ensure they get the best information from this path, encourage end users to create a new thread rather than re-use someone else's thread. The first two require end users to register, which they may not want to do. We should encourage them to register, but not require it. To encourage them, we should make registration very easy (a few fields on the New Question screen) and explain why it's useful to register. Force the end user to at least give themselves a name, and remember this name (via cookie?) for future posts. End users will want to not be distracted by other threads and options that may be useful to contributors. We should provide two different views - one for end users that lets them track their questions and post new ones, and one for contributors that's like a normal forum (forum list, advanced views, etc.). Which view to show could be determined by roles or at different URLs. Threads via arbitrary criteria (advanced search). Threads where the user is still looking for help. Allow end users to mark their question as answered and provide a filter for contributors based on this info. This could be extended to say which post answered the question, which could tie into a contributor rating feedback mechanism. Contributors will be linking to KB content often when helping users, so we should make it very easy to do. Allow contributors to use wiki syntax (double parenthesis) for links. Contributors will want to discuss things with each other that aren't support requests. Give them a forum or forums to discuss things with each other. Notify users of responses by e-mail by default. Mark a thread as answered, and filter based on this data. Live chat will be an easy to use real time communication channel for users who can’t find answers to their questions in the knowledge base and forums. Through a web interface (no download required), users will chat with community volunteers who will be using the OpenFire application. Users should be able to access the live chat from the browser, with no download initially. Users should be prompted to ask a question or tell their problem before initiating the live chat (possibly some segmentation from a drop down menu). The chat should appear to be a 1 to 1 communication. Interface should also include statements e.g. : “Don't give out personal info” (credit cards, usernames, passwords, etc). This page was last modified on 11 March 2008, at 01:38.